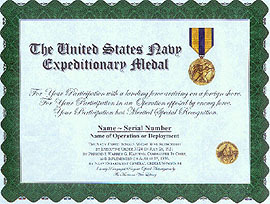 An unaltered photocopy of your DD-214, WD AGO, NAVPERS, NG or other military issued document clearly displaying your award of the Navy/Marine Corps Expeditionary Medal. Please complete and MAIL the APPLICATION FORM, hyperlinked below. (1) The medal will be awarded to the officers and enlisted men of the Navy and Marine Corps who shall have actually landed on foreign territory and engaged in operations against armed opposition, or operated under circumstances which, after full consideration, shall be deemed to merit special recognition and for which service no campaign medal has been awarded. (2) No person in the Navy or Marine Corps service is entitled to more than one Expeditionary Medal (either Navy or Marine Corps). Participation in more than one expedition will be recognized by the issue of bronze stars (one star for each expedition in excess of one), to be worn on the ribbon of the Expeditionary Medal. (3) At present, there is a supply of Marine Corps Expeditionary Medals on hand which will be awarded to Marine Corps personnel participating in authorized expeditions. After this supply is exhausted, the Navy Expeditionary Medal will be the only medal awarded to either Navy or Marine Corps personnel for participation in expeditions. (4) All officers and men of the Navy and Marine Corps who, under the above-mentioned conditions, took part in an operation listed below may submit to the Chief of Naval Personnel or the Commandant, United States Marine Corps, respectively, through official channels, applications for the above medal. The applications should include the names and dates of the expeditions and a statement to the effect that the applicant actually served ashore as a member of a landing party during the period for which the medal is claimed. A. 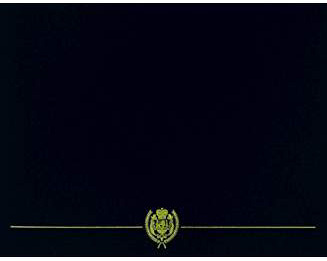 Authorized by the Secretary of the Navy, August 15, 1936.
b. Awarded to U.S. Navy and U.S. Marine Corps Service members who have actually landed on foreign territory and engaged in operations against armed opposition or operated under circumstances deemed to merit special recognition and for which no campaign medal has been awarded. Lebanon: June 1, 1983 to March 4, 1984 (The service member may choose either the Navy Expeditionary Medal or Marine Corps Expeditionary Medal, depending on Service component, or the Armed Forces Expeditionary Medal. 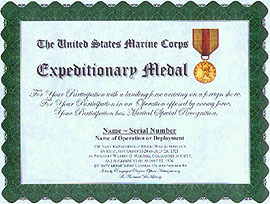 d. Recipients of the Navy or Marine Corps Expeditionary Medals, depending on the circumstances, are authorized to wear certain devices with the award. (1) Wake Island Clasp and Silver "W" Device. U.S. Navy and U.S. Marine Corps Service members who served in the defense of Wake Island, December 7 through 22, 1941, are authorized to wear a clasp inscribed with the words "Wake Island" on the suspension ribbon on the medal and a silver "W" on the service ribbon. (2) Bronze Star. A bronze star is authorized to be worn on the suspension and service ribbon of the Navy and Marine Corps Expeditionary Medals for participation in subsequent expeditions. Establishing Authority; The Marine Corps Expeditionary Medal was established on May 8, 1919, by Marine Corps General Orders No. 33 as a ribbon only. A medal was authorized by Executive Order 3524 signed by President Warren G. Harding on July 28, 1921 (and implemented on March 1, 1929, by Marine Corps General Orders Number 20). Effective Dates: The Marine Corps Expeditionary Medal has been awarded for qualifying service from February 12, 1874, to the present. The earliest qualifying service was in the Hawaiian Islands from February 12 to 20, 1874. Criteria: The Marine Corps Expeditionary Medal is awarded to Marine Corps personnel who land on foreign territory, engage in operations against armed opposition, or who operate under circumstances deemed to merit special recognition and for which no campaign medal has been awarded. Order of Precedence: The Marine Corps Expeditionary Medal is worn after the Selected Marine Corps Reserve Medal and before the China Service Medal. -- A bar with the words WAKE ISLAND is authorized for wear on the medal for personnel who served in the defense of Wake Island between and December 7 and 22, 1941. -- A silver W is worn on the service ribbon to denote the Individual is entitled to the WAKE ISLAND bar. -- On March 1, 1920, bronze numerals were authorized to denote additional awards of the USMC Expeditionary Medal (subsequently replaced by bronze stars). --A bronze star three-sixteenths of an inch in diameter is authorized for each subsequent entitlement to the medal. First Recipient: Marine Corps Expeditionary Medal M.No.1 was awarded to Quartermaster Sergeant Roy L. Kinna for service in Cuba between May and August of 1912. Designer: The Marine Corps Expeditionary Medal was designed by Walker Hancock, and its ribbon was designed earlier by Major S.W. Bogan, USMC. Obverse: In the center of a bronze medallion one and a quarter inches in diameter, a Marine in full pack is shown charging with fixed bayonet. There are wave scrolls at the base where they meet at firmament. In the upper half of the medal, following its contour, the word EXPEDITIONS in raised letters. The figure is that of an enlisted Marine "in action, responding to the call of duty." The scroll waves ending at firmament allude to Marine service and signify an opposed landing. Reverse: In the center of a bronze medallion, an eagle is shown perched on an anchor; the eagle is facing to the left, and the flukes of the anchor are to the right side of the medallion. The eagle is grasping sprigs of laurel, which extend beyond the anchor in both directions. Above the eagle are the words UNITED STATES MARINE COPRS). Above the laurel on the left is the word FOR, and over the laurel on the right, SERVICE. Ribbon: The ribbon to the Marine Corps Expeditionary Medal consists of a khaki background with a broad light gold stripe inside each edge. Numberind: The Marine Corps Expeditionary Medal was originally produced at the Philadelphia Mint and was serially numbered on the rim at the six o'clock position with the M.No. prefix.